Post-war Austerity ­ a colour feature on the 2-8-0 freight engines built during World War II for the War Department. A Signalman's Tale - the work of a BR signalman on the Taff Vale section of the valley lines north of Cardiff by Edward A. Evans. Glasgow St. Enoch - colour photos of a now-closed Glasgow terminus. Away for the Wakes - Michael Blakemore writes about the special trains run during the industrial holidays in Bury, Lancashire. The Spilsby & Firsby Railway - the history of a Lincolnshire branch line by A.J. Ludlam. A Proliferation of 4Fs - colour feature on the Midland/LMS Class 4 0-6-0 goods engines. Amey Roadstone - 1980s colour pictures of stone traffic from Whatley Quarry on the former Frome to Radstock branch. A Brave New World? 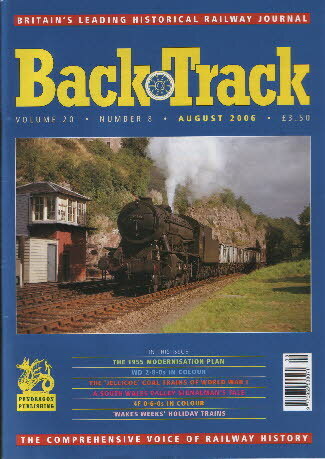 - Keith Hill reviews the 1955 Modernisation Plan of British Railways. In the Works - colour pictures of steam locos receiving works repairs. Coals to Newcastle?- Martin Bodman describes the movement of coal to the Grand Fleet at Scapa Flow during World War I. A Motley Collection - historic photos of locos of the Alexandra (Newport & South Wales) Docks and Railway. To Snowdon Summit - colour photos of the Snowdon Mountain Railway.